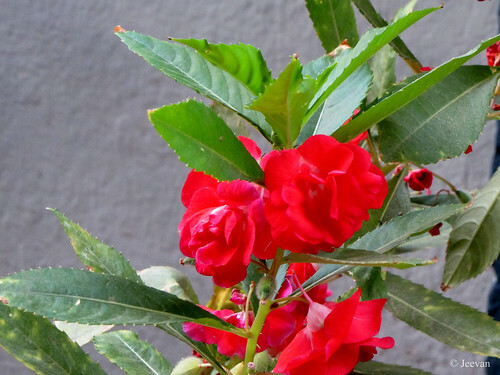 First time I saw the balsam in Valparai, on the Western Ghats and it was bloomed in gorgeous red! Impressed in its beautiful and colorful flowers, my grandmother collected some seeds from there and sowed at our flower pots and in her backyard. The plant grows very fast and looked like small trees grown in pots, but they haven’t flowered and we also stopped watering the plant and later cleared the pots to plant other. 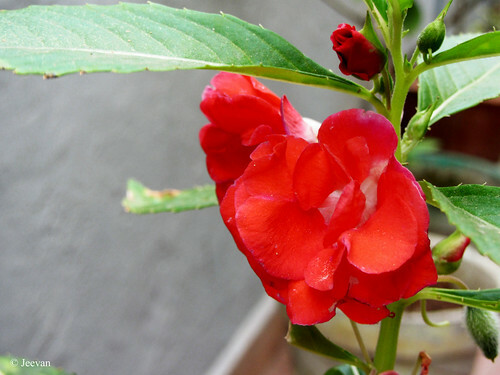 The balsam plant, which is native to the Himalayas has colorful blossoms and also sweet scented. Just look like an orchid growing in the wild, the balsam plant grows in hilly regions and does not require much watering. The plant grows in large numbers and sometimes the whole mountainous region where the plant is seen is covered with pink or red. The balsam plant has a unique way of propagation, which develops seed pods that burst and spreads the seeds far away. The flap of a petal which looks like a helmet and this plant is also called the policeman’s helmet. 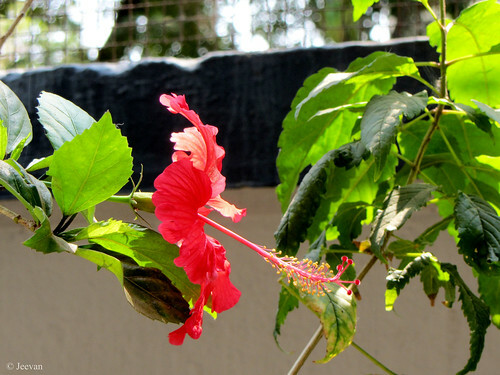 The plant grows for two to three feet and flowers profusely, have leaves bright green in color growing in central arrangement and have wavy edges. The balsam blooms almost similar to rose flowers, look like roses from far and only the fact that they don’t have thorns. 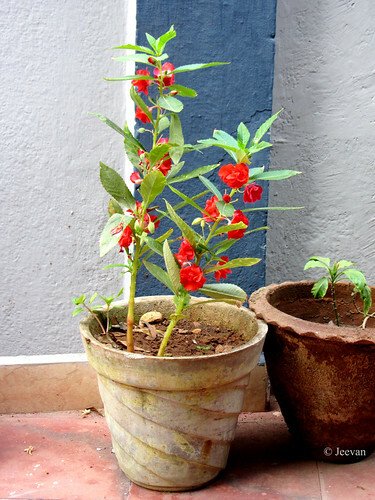 The balsam grows and blooms during summers and beginning of rains, has shown blossom now at home and not from our pot, but the tenants who share our house in upstairs. They have kept their flower pots in front of our house, which we water daily since they haven’t occupied quite yet. Only to a part of it! The picture was composed at home during morning time when sun was shimmering around! 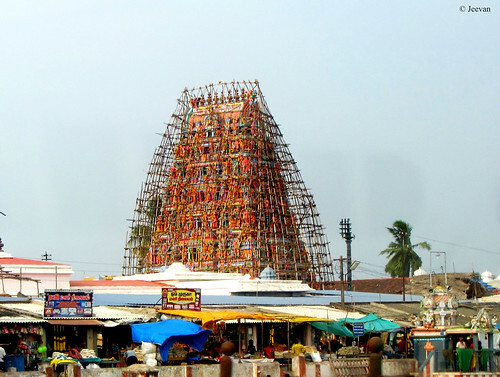 A day ahead to the 16th Parliament election in India for the state of Tamil Nadu, I am looking forward to exercise my franchise as usual in the afternoon while there were fewer crowds in the polling booth. Situated less than a km from home, I have decided to go in my power wheelchair, since I have voted twice already in the last parliament and legislature assembly, I hope there won’t be any difficult this time as well! Already many began to ask me the usual question that rose during election time, was, for whom I’m going to vote. Actually when I come to know there was a youngster, age 26, was contesting in my constituency from Twinleaf, I was overwhelmed to vote him but later I dropped the idea since I couldn't find any individual conducive from his side, rather being a doctor he praise for only the party leader and no public service background out of the party. So I decided to support iLa Ganesan from National Flower, who is a senior leader and bachelor with wealth of just 0.3 million… a transparent being on his personal and public life, even I have difference of opinion on his or his party’s policy, I believe he deserve being a parliamentarian and the National Flower, a hopeful successor for next regime to drag away the corrupted and deceitful Hand! I have decided long back not to vote for the Hand or Rising-Sun, so the decision was likely to make between Twinleaf and National Flower and while looking out for their candidates for my constituency (of South Chennai), I felt good with both of them. One being an active youngster and another senior man, both has different political backgrounds (one being a son of former speaker and the senior is a long time party worker and disciplinarian) and it was the first election for both of them. Being a youngster myself, I have dreams of central and state were ruled by younger people, but standing from their individuality or capacity to work individually on social field rather being a screwed doll. I don’t think the Twinleaf candidate is eligible for what I was expecting (even I know I deserve nothing to comment on others), I have the right to chose my candidate and I find iLa Ganesan is best and I like to vote for his transparent being and let National flower flourish. I add here a link on iLa Ganesan's interview! I had a small outing last Sunday with my family on the outskirts of Chennai, taking a detour among the countryside and few forest routes leading all the way to my grandfather’s village on the Chengalpet-Thiruporur road. Rather taking the usual routes of ECR and OMR, I went on the roads that are alternate but not far from the IT Corridor and about 15km of stretch that was explored by me for the first time. My uncle suggested me this route that has big lakes (without traces), some patches of reserve forest and villages alongside farm lands. 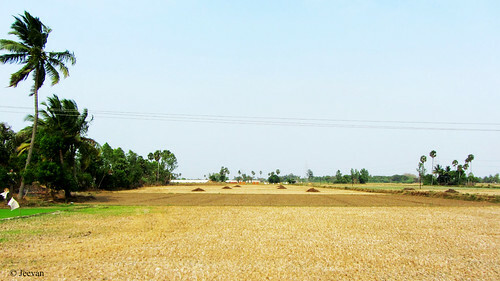 It’s quite out of traffic and the smooth road helps enjoying a leisure ride, breathing fresh air that blend with the village scents and fields of green and harvested lands producing different scenes to sight. We had our lunch at the tree shades, shattered on barren or waterless lake and felt hot only for minutes out of the car where we used to the afternoon breeze, which pleased later when temperature soar down. We also forget to switch on the A/C once back in car and began to move with the environment that has something to share or capture enough. 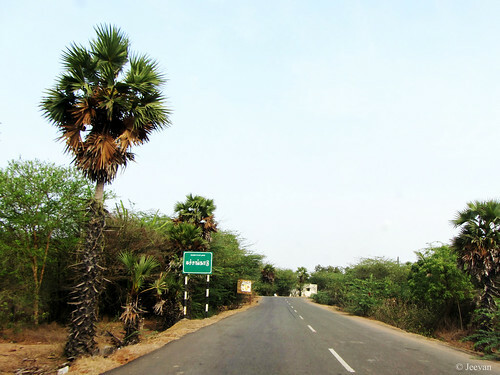 We find number of nochi plants gown on the roadsides, which helps in driving away misquotes but we aren’t sure will it survive if uprooted and replant at home. So dropped the idea of picking it up and the plant produces a smell which was sweet odors. 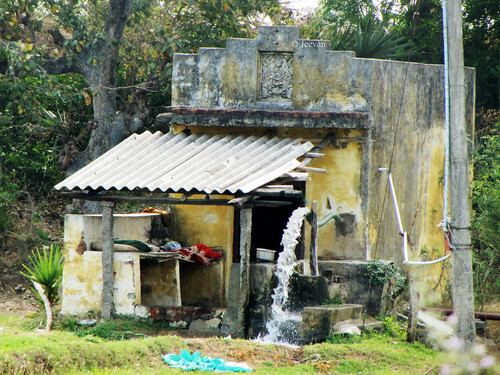 We drive past into few villages along with my grandfather’s and had a look at his abandoned home that turned to be worst in condition seeing it after five year. 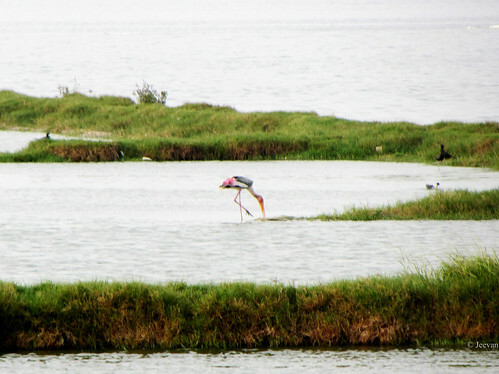 While back we took the OMR and then turned towards Kovalam, as I liked to see some birds on the backwater… but I was chanced little with the sights of heron, few painted storks and cormorants at distance. 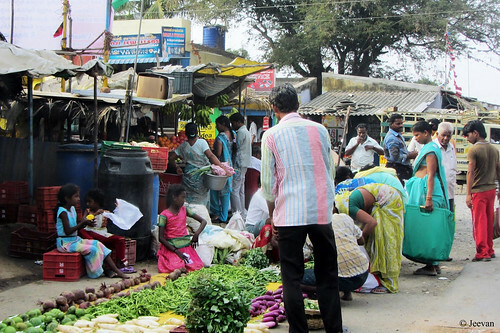 We also stopped at the Thiruporur market to purchase some fresh vegetables and greens, which we usually do if whenever come across this town. 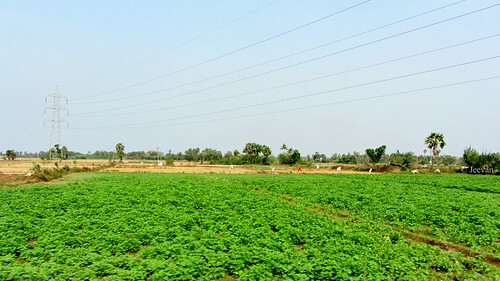 Because the vegetables sold here are harvested by the local farmers from their fields and the greens is one we could find many here. The bore wells those dug for water source had become not only life threatening but almost embrace to death, has rise in toll. In last ten days, three kids were fell into the bore wells across the state and only one was able to rescued alive. 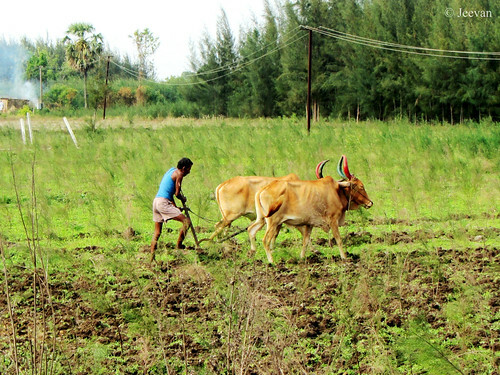 At the current state of drought and water scarcity, bore wells were the only hope of farmers in spite of lack of rain and groundwater levels dropping 100s in feet, farmers who inadequate with single bore well kept digging around seeking water as deep as possible has increased the number of bore wells across the state and country. It’s quite carelessness and lack of awareness about concealing the bore wells that are not in use has took number of lives in past, but we still continue to bear with uncared attitude to feel only sorry after an incident take place. We can say it’s as accident and forget once the news flashed with another but what if it happens at series. The Supreme Court has already advised government how to regulate digging bore wells and maintaining it safely, but none were so far into functional and they just pretend to give priority only at that moment. Apart tightening the regulations for bore wells, we are also in need of advanced technologies into the rescue operation to save kids as quickly as possible or keep them alive inside. We need to appreciate our fire servicemen who regularly involve in rescuing children who fall into bore wells as alive or lifeless, is a tough job and sure some technology like the robotic that helped in saving a kid in Thirunelveli - developed by a Madurai based ITI educator - will bring hope and easy the rescue. 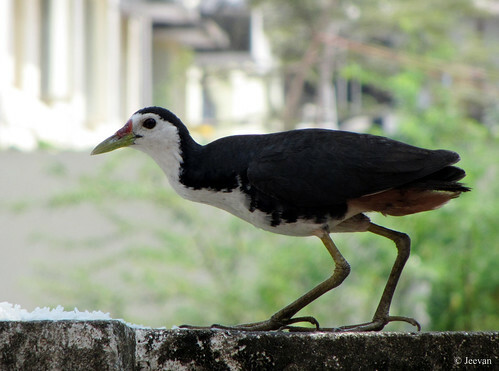 The White-breasted Water Hen had been a resident of my former neighborhood in Thiruvanmiyur, Chennai, was stayed with its family. The open vegetation opposite to our then apartment provided shelter to the water hens along with other species of birds and reptiles, but I have seen only the adult hen (may be a female) which come flew or leap on our compound wall to feed on the gains left by us to the birds and go back quickly as possible hiding among the bushes. I was happy to capture the water hen couple of times while it came feeding on the compound wall and only my mom had seen her with juveniles since I can’t lookout the compound wall, about 5 feet height. As we shifted houses, I don’t know what happened to the water-hens since the vegetation was cleared and an apartment on construct right now wanted me to think they immigrated somewhere. 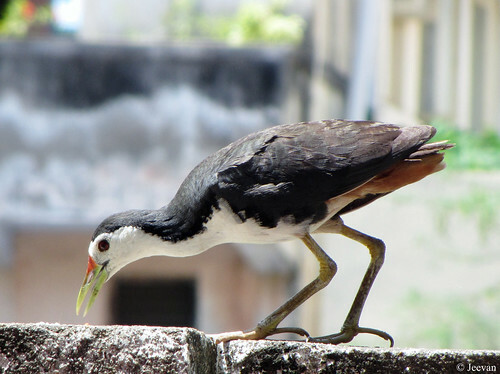 The White-breasted Water-hen is a water bird of the rail and crake family (Rallidae) that widely distributed across Southeast Asia and the Indian Subcontinent. It is a large and distinctive rail species with dark grey upper-parts and flanks and conspicuous white under parts, from which the species gains its common name. The beak of the bird is yellowish with a reddish base, which becomes more olive outside of the breeding season. 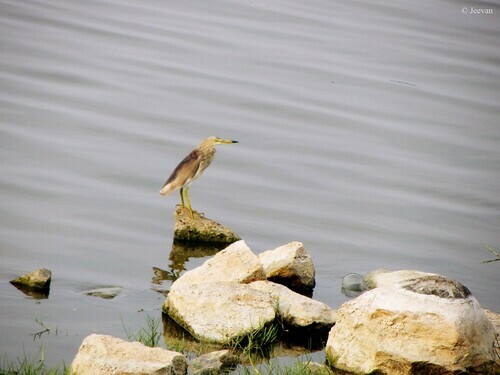 The water-hen has long legs, colored in yellowish with large feet and legs dangled in flight. 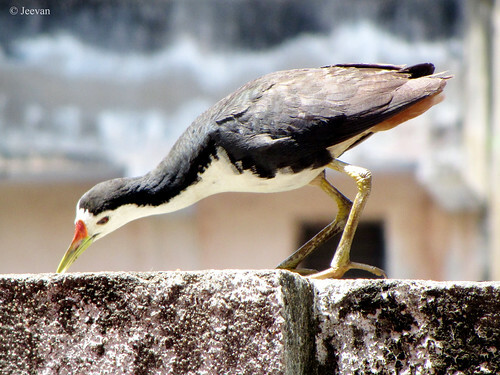 The female birds are generally smaller than the male, with a somewhat duller beak, while juveniles have duller plumage with the white of the under parts tinged brown and a darker beak and legs. This species is described as being very noisy during the breeding season, producing a loud call consisting of various grunts, roars, quacks and chuckles, followed by a repeated kru-ak, kru-ak, kru-ak-a-wak-wak. The bird feed on the ground had varied diet including insects, worms, small fishes and grass seeds and roots and shoots of marsh plants. While the other part of the world welcomes spring with uplifted spirit and energy and celebration of colorful blossoms, we are forced into the sultry heat and summer sweat makes quite exhausted. We aren't in the middle of the summer yet but still experiencing hot weather felt like ever to recollect on memories. Though the entire day wasn't under the control of heat - the post afternoons are pleasant rose to sea breeze - waking up and leading up to noon seems frustrated and fatigue, which I experienced a lot today. I wasn't active enough from morning and was out of concern and running out of time to keep in touch with deeds I vow to do daily. I hear complains of raised temperature from various part of the country early to summer, the fear of running out of water or electricity threatens people and they believe all the comforts will lead only up to the day of polling to parliament (Apr 24). I am going through the phase to decide whom to vote and I concerned for their vows to the constituency and public service mind rather praising their party or party presidents. During last parliamentary election I voted for an individual candidate who promised hope, even though I was certain that is his winning was impossible I tried the best selecting the candidate. I don’t believe in voting for who show hope of winning or party based polling, as I know there are many who vote only for certain political parties whoever the candidate maybe… I wish they change their mindset and vote on their individual thought. Coming to the summer heat, I believe I experience the least sitting inside the house with an option of getting cool under the air conditioned room, but those with work outside and mainly under the sun seems unbearable. I never been an A/C guy and avoid as much possible unless unbearable or due to pollution and dust while going out in car, I am quite a natural being and enjoy the cool breeze brushing through environment than facing A/C blower. There’s nothing equivalent to the source of nature, even it hurt us sometime comforts though its various aspect bringing smile on face. I relived little bit by this time of (4.pm), and it seems living close to school zone increases the anxiety by raised temperature and expose to whistle sounds, horns of cars that deliver and deposit students and noise of engines and vocals creates wreck to environment. I really liked the environment out here in evening … just opposite to what we experience until 2pm and no one will believe it was high in decibel at morning. The heat waves and sunshine has settled down by now, but still it wasn't favorable due to humidity in air. It sounds terrible how we going to pass this summer, however better it was in latter year seems worse and there won’t be inadequate suffering. You perhaps could guessed the reason for my absence here since I have announced about house shifting and I am glad I did so thus u no need to worry what happened to me. I couldn't get my net connection; even though the Airtel was quick attending us, the lack of space on the Airtel box in our area delayed my connectivity. It took four weeks to get back the connection; a duration ever took so far since got internet connection at home in 2004 and shifting couple of houses. It was quite a month I blogged and totally out of touch on any online activity, but it wasn't bothering me much as I took it as a chance to spent time on other works that were left incomplete and lack hands for some time. We also thought to go for other internet connections disconnecting the Airtel but I don’t find anything better than that and the new entries with 4-5 times high speed access faces the same problem with no empty slot in their boxes. We transported things almost on the first weekend of March and handed over the key to owner (of previous house) on 3rd evening following quite occupation of this house. We settled well within two days of shifting house and it was a safe and smooth transfer and arranging things wasn't difficult because of helping hands from my aunt and cousins. The house being situated right opposite to Adyar Sishya School, the environment was little noisy but after 3 pm it was quite calm and silent. I see all kind of cars here, picking and dropping students and it was also entertaining checking the activities everyday through the window facing the school gate. I don’t find any difficulty with this house and it is convenient enough for the four of us and being a duplex house, we don’t find heat sweat drop our spine much rather it was cool breeze brushes in evening. The house, as well the area comes under the canopy of tall trees and in evening I could hear birds twitters aloud and I get to see bunch of green parrots come screeching and preaching the tree tops. Other day I find a rufous treepie chased by crows for which it shrill cried to escape. We also received special guests through backyard - the bonnet monkeys came in about a group of ten two days later we shifted here. I know there are monkeys in this area which takes shelter among the canopy of trees covering a large portion that begins from our home rear. I wonder when I noticed the windows of this house having an additional door-frame of net which is enough for small bugs to enter… so it is not a net to keep away insects or mosquitoes, but only after receiving the monkeys I understand that these net frames must be laid to prevent young monkeys entering the house through the enough gaps in grills or leaving hands to loot anything. The monkeys weren't threatening in anyway rather they all seem kind and leisure coming around the neighborhood. There’s nothing much to complaint about this house and I feel better than what I really thought early. This is also a corner house just like the previous house, with an arched gateway that was adorn by Nithiya Malli (eternal jasmines) creeper making a flowery welcome. The house shifted to Adyar helps us working/sharing close with our uncle’s family who lives at our native house here. The distance between ours was just more than half a km, which I covered in my wheelchair last Sunday while visiting a corporation park nearby. I spent most of the time last month reading books and watching television esp. buying a DTH HD make it more interesting watching, going through its amazing details and clarity. Last week my father went through sever abdomen ache due to some infection, put him into hospital for couple of days and it was my uncle’s family whose support wasn't there could have made it more trouble, esp. taking care of me while mom was away with dad in hospital. My uncle stayed with dad during nights at hospital and aunt visited home taking care of food preparation isn't so practical easy if we continued stayed (5 km) away from them which was the then situation before shifting house. I think we moved on the right direction now rather going out of comfort in search of space, solitude and less in pollution environment. Dad is doing much better now and hope he’s fine in few more days, my uncle and cousin visit us everyday helping in our need. Thus life goes fair well unless for dad’s health, post shifting house was very positive on me and the new environment is encouraging to involve in other activities as well.